Making the transition from a mainstream brand to luxury marque may mean consumers end up committing to a larger cash outlay than what they prefer. On the other hand, the Buick brand provides an intermediary step between the two choices, something few nameplates can claim. In effect, Buick makes it possible for Chevrolet owners to ease into luxury before deciding whether Cadillac or some other high-priced make is right for them. Buick’s competition has faded in recent years as Ford’s Mercury brand is gone and Chrysler now competes with Chevrolet. At the same time, Acura and Lincoln products are fair game, offering a premium feel much in the same way that Buick does. 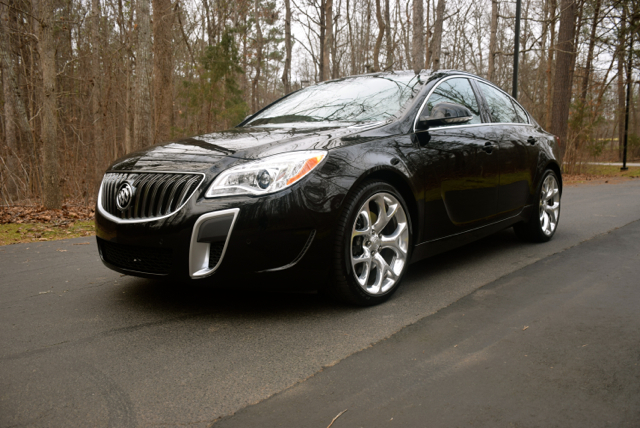 The Buick Regal is one such model that competes with the upscale brands. Its chief competition includes the Acura ILX, Audi A3, and the Lincoln MKZ. The Regal is based on the Opel Insignia and is best compared to midsize mainstream models or premium compact sedans. Now in its sixth model year, the current generation Regal is nothing like the previous models. The name can be traced all the way back to 1973 when GM released a family of intermediate models for Chevrolet, Pontiac, Oldsmobile, and Buick. This collection of rear-wheel drive coupes and sedans were downsized in 1978 and yielded some of the most noteworthy models, including the Grand National and GNX. Beginning in 1988 and lasting through two generational changes before its cancellation in 2004, even smaller versions of the Regal were built. GM had also switched to a front-wheel drive layout by then. After a seven-year hiatus, the Regal name was resurrected and the first models were imported from Germany. However, a factory in Oshawa, Ontario, was soon given the honors to build the North American-spec model and has served in that capacity since. Buick offers the Regal in 1SV, Standard, Premium II, and GS trim levels. Front-wheel is standard across the model line; all-wheel drive is available in the two upper trim levels. 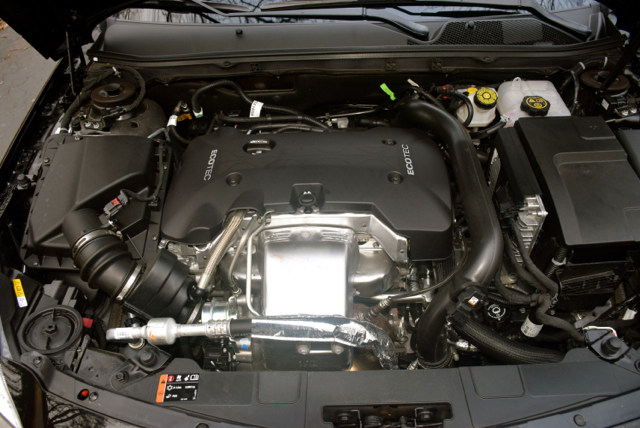 Upon its 2011 release, a 2.4-liter naturally aspirated four-cylinder engine was standard and a 2.0-liter turbocharged four-cylinder was available. Both engines are still used and are paired with six-speed automatic transmissions. From 2012 to 2015 you could opt for a 6-speed manual gearbox. Unfortunately, sales never justified the stick’s existence, thus this option was quietly removed for 2016. Starting in 2012, Buick began offering a mild hybrid system called eAssist, what enables the Regal to achieve 36 mpg on the highway. Originally offered to all customers, the hybrid is now provided to fleet customers only. 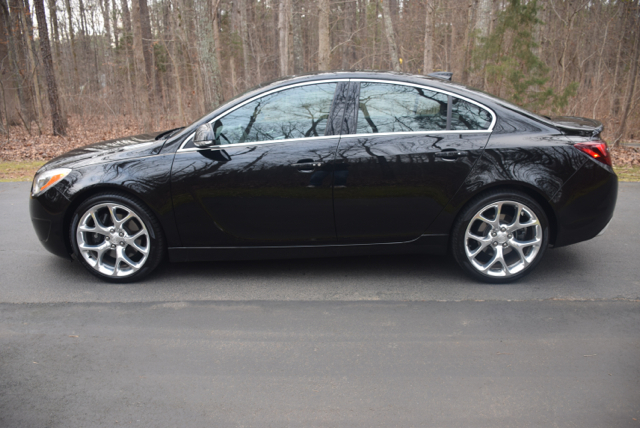 The 2016 Buick Regal GS is priced from $36,490 and represents a new, lower price for this sport sedan. Indeed, when I tested a 2015 version last spring, the base price came in at $39,810 or $3,320 higher than the 2016 edition. Further, the sticker price on the earlier model was an eye popping $44,670 compared with the $40,550 on the most recent driver. Importantly, the price cut means the content is unchanged or at least it has changed for the better: Apple CarPlay is now included. So, why the drop in price? Doubtlessly there are two things at play here: the competition is selling their cars for less and consumers continue to gravitate to crossover utility vehicles. That being said, the Envision crossover joins the line this spring, a model that is certain to siphon sales from Buick’s family of sedans. The GS’ arrival followed my week with an Acura ILX. Hands down, the Buick is the better model. But that’s not an entirely fair comparison as the ILX is offered in front-wheel drive only and there is no turbo option. The ILX is slightly smaller too, as it is based on the Honda Civic’s platform. Still, the Regal offers a more elegant presence, a quieter cabin and better quality materials. You should also keep in mind that the comparison was between the top-end Regal and a more run-of-the-mill ILX. Dressed in Buick garb, the Regal GS is a handsome little sedan. It offers room for five, but the back seat is tight. Nevertheless, the sedan should appeal to a young executive, perhaps one with a spouse and small children. Otherwise, the growing family may find the Enclave SUV more to their liking. The Regal GS comes with a thickly padded, leather-wrapped steering wheel. Behind that wheel is a three-analog display featuring a tachometer, speedometer and fuel/oil displays. At the top of the center stack is a set of six switches — it is easy to overlook them, but don’t. Besides the lane departure warning switch, you’ll find the GS’s interactive drive control system. Pay special attention to the two switches on the outside of the row as they contain “GS” and “Sport” drive modes. Both modes adapt ride and handling, especially at high speeds; the GS mode provides the highest level of handling enjoyment. Credit Buick with developing a model that is very comfortable for the driver. 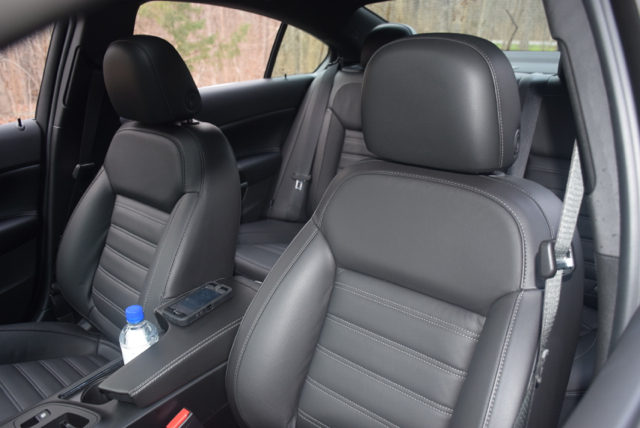 Leather-appointed seating, heated front seats, and a 12-way driver’s seat is at the ready. 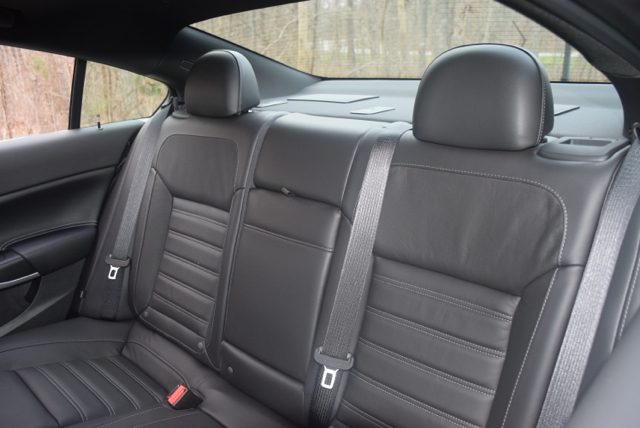 The only feature lacking is a seat extender, usually included in such driver’s cars as the BMW 3 Series. Press the ignition switch, engage the transmission and you’re ready to discover everything this sedan offers. Soon, the turbo spools and begins to deliver the full measure of its 295 foot-pounds of torque, enabling the GS to zip down the road with authority. The all-wheel drive system includes a four-wheel independent suspension with wheel-slip management and an electronic limited-slip rear differential enhancing handling. A HiPer Strut front suspension is also at work, limiting torque steer. 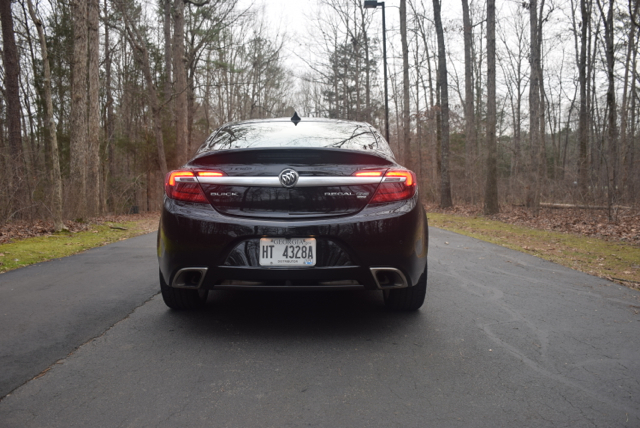 You’ll feel confident on twisty roads, but you’ll also sense the difference between the Buick and the high-end European sedans. Whereas a 3 Series always feels poised and planted, the Regal GS subtly reminds you that without all-wheel drive at work, it would be just another pricey sedan. The current generation Regal is now in its sixth year. A 2014 refresh brought light changes to the exterior, update the equipment catalog and brought in additional safety features. A redesigned dashboard also was introduced. The next-generation model is probably a year or two away; keep an eye on the major auto shows for its introduction. The Regal GS is the sportiest Buick model of the millennium, although it doesn’t go far enough for people who would like to see the brand flash its high-end performance side for the first time in nearly 30 years. That may be left up to a new model based on the Avista concept, a rear-wheel drive coupe introduced at the 2016 Detroit auto show (NAIAS), one with Grand National or Riviera aspirations. 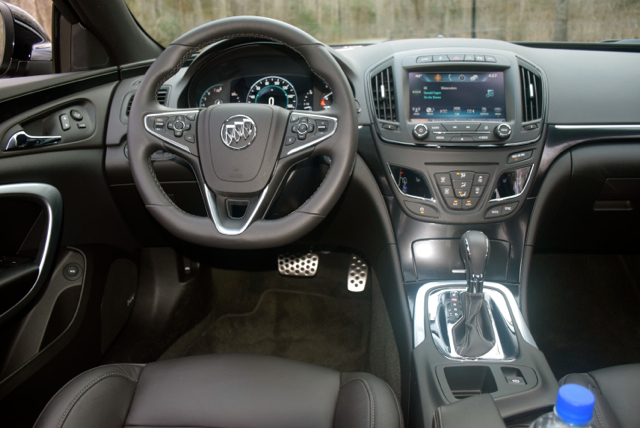 2016 Buick Regal GS photos copyright Auto Trends Magazine.